Ermac is a returning character from the last Mortal Kombat game, well known for his strong telekinetic talents. In MKX, his character is split into three variations that comprise of Mystic, Spectral and Master of Souls. He's a typical stand-off character that uses range to his advantage to unleash powerful attacks. Ermac was never meant to be an MK character but as a consequence of the fans desire to find the mysterious red ninja in MK2 (who never actually existed) the creators decided to introduce Ermac in MK3 as a tribute. Unlike other characters, Ermac constantly floats just above ground level. One of his variation moves allows him to harmlessly hover in midair making it difficult for the opponent to strike without jumping. This hover position is the perfect starting point for downward strikes such as kicks and ground smashes to punish the opponent. 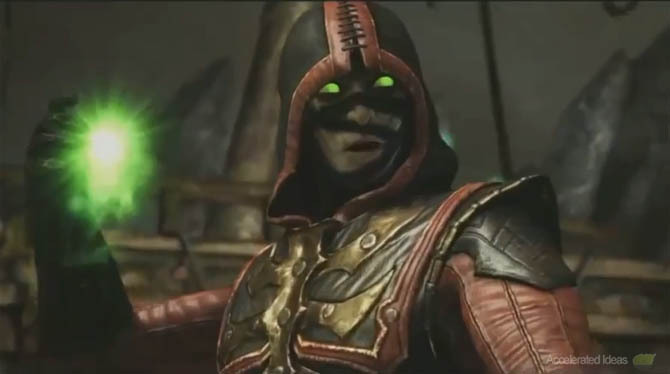 His trademark teleportation is a core move, that allows Ermac to teleport both from midair and at ground level - in either case the teleport attacks the player, knocking them to the ground rather than just changing Ermac's position. The Force Blast is a handy short range projectile whilst the kinetic lift is a long range, hands-off grab and smash move. Unlike in previous games the lift move doesn't guarantee a combo starter (in most variations). 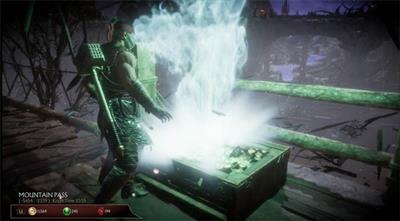 Ermac's appearance changes slightly across the variations .In the Mystic variation he has glowing green arms but in the Spectral variation he has a glowing green chest piece. Master of Souls class is the most distinctive with the character surrounded by up to three tiny glowing balls - the number of which determine whether the Soul Ball special move will stun the player or not. A short range projectile that can be aimed upwards and also shot from the air. Lift the opponent up in the air and then slam them down to the ground. The opponent bounces making the perfect combo starter. Teleport behind the opponent, striking them down in the process. Can also be used in midair. Gains additional telekinetic abilities. This variation is perfect for "footsies" (dominating an opponent from range) thanks to some excellent telekinetic moves, one of which is a great combo starter allowing you to dash in for a series of Ermac's best routines. An enhanced version of the MK9 move that stuns and pushes the opponent away. It's a ranged move that shoves the opponent to the far end of the screen. The classic levitation move leaves the opponent hovering upside down in the air. It's the perfect combo starter, similar to Kitana's fan lift. An air based class which gives Ermac the ability to fly and attack from the air. This is a chancy variation with only one additional special move that so far seems to offer more risk than reward. Allows Ermac to fly around the screen - sort of like an extension to the Hover move. The move only last about 5 seconds and you can't block while using it. Gains invisibility and a new Soul Ball special attack. This variation is a mixed bag that provides a momentary hover move for faking attacks (or launching a delayed attack) and a complete vanishing move to confuse your opponent midstream. Float in midair making it hard for the opponent to attack you but also setting you up perfectly for an air attack. Launch a fast long range projectile. If there are three souls floating around Ermac's body (the little green balls) the ball will stun the opponent ready for combos. Temporarily disappear from the game, making you completely invulnerable but unable to move. This effect only lasts a second or two and you can launch attacks which will immediately cancel the vanish effect. At sweep distance, Ermac uses his telekinetic powers to pull the head off the enemies shoulders and hover it appear the body. He then pulls its straight back down into the body and summons it out of the players chest (Alien style!). Ermac then leaves the head hovering below his hand like a yo-yo without strings. 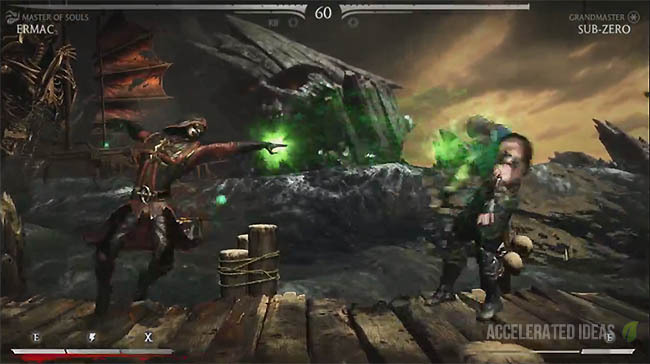 Ermac uses his telekinetic powers to split the opponent in half from the waist down. The top half of the body pops up into the air in slow motion before flying to the ground.